Our charming three bedroom cottage is JUST ACROSS THE STREET from beautiful LANIKAI BEACH. There are king size beds in two of the bedrooms & twin beds in the 3rd bedroom. All bedrooms are air conditioned. The renovated kitchen is open to the living and dining room and opens in the back out to a large lanai with two large tables and BBQ. We have beautiful Pergo Koa floors throughout the house and ceiling fans in all the rooms. One bathroom has a large shower and the other has a tub and shower. Parking is available on the grass in our spacious yard. We have wireless internet, TV, DVD, shared washer/dryer, all linens & cooking utensils, toiletries, beach chairs and towels are also included. Registration #40695220 - GE/TAT#211-694-7968-01 . Our home is available year round at $6000.00. a month plus tax and cleaning fee. We have a 30 day minimum. We are truly a mom & pop business. Barney was born and raised in our home which was purchased by his parents in 1938. I joined the family in 1964 and we enjoyed raising our six children at this beautiful location. All our guests tell us how special our place is, what peace they feel here, and what a blessing it was to stay here. We are still here and look forward to meeting you. We really enjoy having the beach right across the street as we often walk over to catch the morning sunrise and later go for a swim, snorkel, paddle or nice walk. Kailua town is just 10 minutes by car from our house. It has grown in the last few years to include many wonderful restaurants, supermarkets (including Whole Foods) and a Target Store. From our spacious yard you can see the path to the beach and the ocean beyond. It is actually only a few steps from the house. 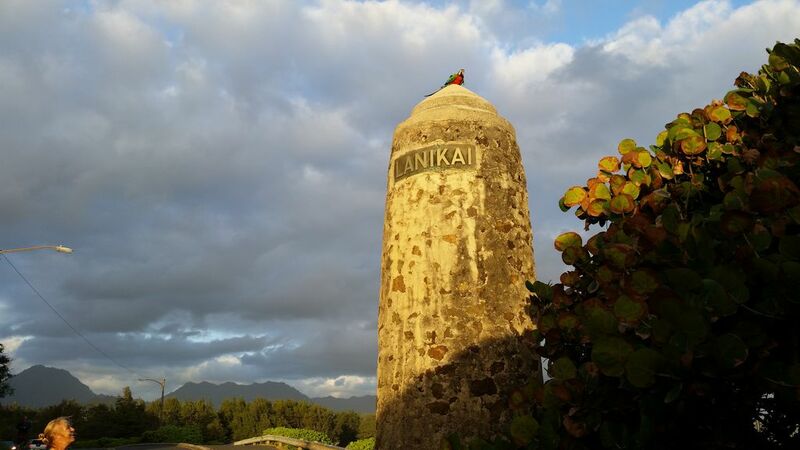 From our back yard you can see the hikers on the trail and up to the now famous pillboxs built during World War II. It is a short walk from our house. Best vacation rental ever!! Very clean, well equipped, and very friendly owners. The property is perfect for families of all ages. The Sonrise Cottage in Lanikai is exceptional! It really is only steps from beautiful Lanikai beach; you don't even need to put your shoes/sandals on! The beach is perfect for swimming, snorkeling, sand play, SUP, kayaks. Surfing and boogie board waves close by at Kailua Beach. The house is well supplied with abundant towels, bedding, beach chairs and toys, and the kitchen is very well equiped. We loved our time in Lanikai and our hosts were gracious and helpful. The aloha spirit lives here. The best part was the landlords. They welcomed us into the true Hawaiian lifestyle. Exactly as described. Comfortable, charming "old Hawaii" house in residential neighborhood 50 steps to the best part of the best beach. Lovely hosts. I cannot say enough how much we enjoyed our stay and vacation at the cottage. The owners love and maintain the home making it comfortable and clean. They have great advice overall about the island and make you feel like you are at home. The bedrooms are very comfortable with small air-conditioning units in each room. LOCATION, I cannot say it enough, location, location, location. The house has private parking and gates where you feel spoiled watching people try to park for the Pillbox hike or get to the beach. The beach is only steps away making it ideal to watch the sunrise over the Mokulua islands every morning. Our family felt spoiled staying at this charming house, loved cooking family meals and eating on the large back porch. By far one of the best vacations we have ever had. First of all the owners of this property are excellent host and lives on property. The home was well maintained, clean, and fully equipped to make you feel at home away from home. The three bedrooms were well appointed, clean, and comfortable with Hawaiian decor and memorabilia of Lanikai, The Home History/Family, and Hawaii. The covered deck was very roomy with tables, benches, chairs, and a gas barbecue and offered a spacious place to hold our luncheon for many family and friends. Our Children enjoyed the large yard surrounding the house and allowed them lots of space to run and play. The yard was large enough to support parking for our rental cars and visitors. The air condition units in all rooms offered a great relief from the Humidity and made the nights very comfortable. The pathway to the beach from the house was conveniently located and we spent everyday at the Lanika Beach which offered photo opts for spectacular sun rises . They also had a variety of water toys for adults and children alike (Surf Boards, Boogie Boards, snorkel and mask, sand toys. sand chairs, beach towels, and more) for more fun at the beach. The Kitchen was fully equipped to satisfy any Chef's requirements to eat in or enjoy the many restaurants in Kailua. We felt like Ohana (Family) because the owners interaction and attention to every need during our stay. I would highly recommend this property to families, friends, and anyone who wants to experience the lifestyle of Hawaii and all of its rich history. We have World Famous Lanikai Beach just across the street with great snorkeling, swimming, kayaking, or just laying in the sun. A hike up to the pill boxes is just a couple blocks behind the house, a great bike lane around Lanikai Loop and on through the beach park and into Kailua town for great restaurants and shopping.